Breadfruit (Artocarpus communis) is a tall tropical evergreen tree of the mulberry family, native to the Malay Archipelago, and a close relative of the jackfruit and Osage orange. They have been found throughout the South Pacific since prehistoric times, and today are a staple food in many of the Pacific islands, Southeast Asia, the Caribbean and parts of Africa. The fruit is a round and bumpy, 8-10 inches across, weighing 4-6 pounds. They are rarely eaten raw, but rather used cooked as a vegetable - any method used for potatoes may be used for breadfruit. The white flesh has a bread-like texture and a flavor somewhat like an artichoke or chestnut. Some people find both the taste and texture objectionable. The seeds (called 'breadnuts'), the leaves and the flowers are also eaten. The bark is used to make cloth, and the wood for furniture and canoes. The milky sap is used as glue and to waterproof canoes. An 8-10 year old breadfruit tree can produce 700 to 800 breadfruits a year, each weighing 4 to 6 pounds. Breadfruit have a very high starch content, up to 65% by weight, with 18% sugar and only 10% water. William Bligh was Captain of the English ship 'Bounty' sent to Tahiti in December, 1787. The mission was to collect and transport breadfruit trees to the West Indies as a new source of cheap, nutritious food for slaves in the West Indian English colonies. The ship arrived at Tahiti in October 1788, and it took another 5 months to collect and prepare 1,000 breadfruit trees for the trip. The Bounty left Tahiti on April 5, 1789 and on April 28 the most famous mutiny in history took place. After being set adrift in a small boat, Captain Bligh made it back to England in 1791. 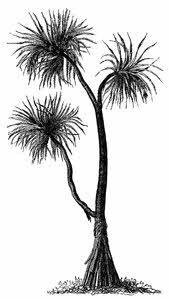 In 1792 he was back in Tahiti and this time was successful in transporting the trees to the West Indies where the trees thrived mightily ever since. However, the ultimate goal of the mission was unsuccessful - the slaves refused to eat the unfamiliar food. It took some time, but the breadfruit eventually became a staple food in the West Indies.